Occasionally though it comes time to sell some shares and close a position. Sometimes that decision is due to valuation and other times it's due to concerns about the company. You don't see too many sales within my portfolio and just glancing at the post labels you'll see it heavily skewed towards purchases. 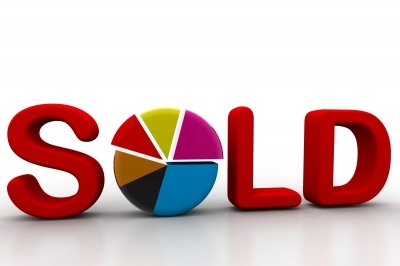 There's over 130 Recent Buy articles, but this is only the 9th Recent Sell article. So yeah I much prefer to make purchases, but sometimes the market or the company compels me to sell. Last Friday, September 2nd I made the decision to close my 81.149 share position in HCP, Inc. (HCP) for $39.09 per share. I first purchased shares of HCP in October 2013 and doubled my position with an additional purchase in December 2013. In that time I reinvested one dividend payment that added 1.149 shares. The following table shows the investment transactions/cash flows and various return calculations. As you can see this wasn't my finest showing as far as returns go, but I did turn a profit so I can't complain. 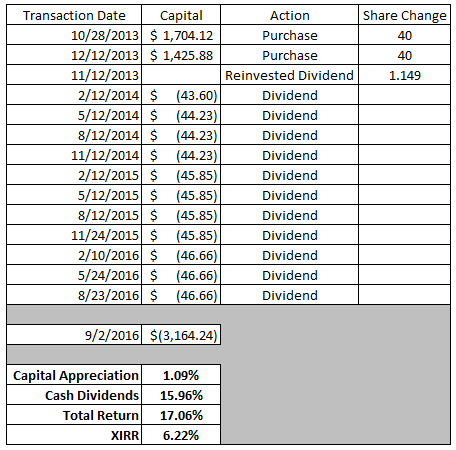 Capital appreciation provided a 1.09% return and cash dividends did the heavy lifting with a 15.96% return. That gives a total return of 17.06% in nearly 3 years. I prefer to look at my returns on an internal rate of return basis because that takes the timing of everything transaction into account and timing is everything. When we look at the internal rate of return for the cash flows of my HCP investment the annualized return comes to 6.22%. That's definitely nothing impressive, but I'm pretty happy with over a 6% annualized return considering the share price essentially went nowhere. HCP is a health care real estate investment trust which I'm very bullish on the combination of those two. So why sell if I'm bullish? Well, it really comes down to the upcoming spin-off of the skilled nursing unit. The skilled nursing unit, primarily HCR Manorcare has faced all sorts of issues over the last several years and has frankly been a thorn in the side of management. Demand for skilled nursing has dropped leading to declining rents and there's not much end in sight as many of those facilities rely on government payments and you can't really argue with what the government says they'll pay. Not only that but HCR Manorcare even knowingly tried overcharging Medicare/Medicaid. So yeah, there's trouble ahead. It's important to remember though that HCP isn't on the hook for the actual issues revolving around HCR Manorcare, rather they're just bystanders that are having to deal with the fallout. Management has decided to spin-off the skilled nursing part of their real estate portfolio into a new REIT called Quality Care Properties (QCP) and I want no part of this new company. So the decision was sell before the spin-off or wait until the spin-off and sell the QCP shares. On top of that management hasn't been too clear with the dividend policy after the spin-off which leads me to believe that there's likely to be a dividend reduction. Now, I believe that the dividend should be reduced if you're splitting the company up, but since I don't want to own QCP why deal with the reduction? I wouldn't be opposed to re-purchasing shares of the parent company HCP though once the spin-off is complete. Unfortunately any time you sell a position that means you no longer get to receive dividends from the company. HCP pays a hefty dividend with a current yield of 5.8%. As such HCP provided over $186 in annual dividends and was the 10th highest dividend payer in my portfolio so losing those dividends stings a bit. 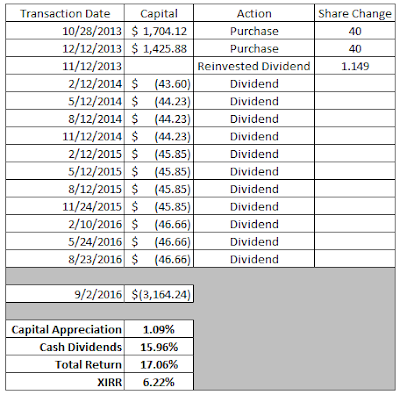 My FI Portfolio's forward 12-month dividends decreased to $5,464.91. My Loyal3 Portfolio's dividends are still at $65.06 which brings my total taxable account forward dividends to $5,529.96. Proceeds from this sale came to $3,164 and adding that to my current cash balance of ~$3,400 leaves me with around $7,500 to work with. Unfortunately I'm not seeing a lot of value in the markets at this time so I'm not likely to invest this capital anytime soon. So my plan, as of now, is likely to use this capital to be a bit more aggressive with options. Ideally I'd find some dividend growth companies that are attractively enough priced that I can sell put options to generate extra income until the shares are "put" to me and then turn around and sell calls until they're "called" away. This will allow me to generate a return via option premium until more attractive values present themselves. Do you own HCP, Inc.? Are you planning on holding both companies after the spinoff or selling your HCP shares like I did? Did the same thing. I don't want to become owner of Quality Care Properties (perhaps Low Quality Care Properties would have been more appropriate!?). Additionally the uncertainty about HCP+QCP dividend policy after spin-off. I may return to HCP after spin-off, but need clearness to that dividend policy going forward. The uncertainty regarding the dividend on top of the spinoff of what will be a struggling company at best for a few years made the decision pretty easy. Especially since the share price had recently moved back up to essentially my cost basis. I like what will be left of HCP after the QCP spinoff so I might add them back into the portfolio. I just sold mine 2 days ago when it was in the around 40. In addition to your reasons, I wanted to shift my REIT investments to my tax deferred accounts. Yeah I missed out on the little bump back up over $40. Seems like the stock always has an extra 1-5% pop left in it whenever I sell. I can't blame you at all for trying to get your REITs into tax deferred accounts. I actually have some cash sitting in my Roth IRA right now but there's not much that looks all that good. I'd love to get some Realty Income shares in there but not at these valuations. Good riddance, JC. HCP has made a bad situation worse the way they are handling the HCRManor issues. These kind of moves are unacceptable and you dont want to be left holding this stock. I like the company that will be left behind after the QCP spinoff but I don't want any piece of the spinoff. So instead of waiting and then selling the spinoff it made the most sense to sell early, build some cash and reevaluate the company. I don't want to own the parent HCP only because it was already in my portfolio if there's better options out there. Oh man... I am getting closer to pulling the trigger on this one as well. I just dont care for the uncertainty, even though I only have $1500 or so invested. I am not interested in owning the spinoff. I guess I need to make the decision soon and move on. Thanks for the reasoning behind your sell. I usually like to get the spinoff company, wait and evaluate the separate companies on a standalone basis. But in HCP/QCP's case it made more sense to me to sell beforehand. QCP is a mess and they're going to need at least a couple years to try and right the ship with no real guarantee that it'll happen. I only have 10 shares, and its yield is the highest amongst my holdings, I'm reluctant to sell pre spinoff, but if the rate actually increase, I'll see no profit and miss my chance to sell. HCP could be one of the highest yielders in your portfolio for a reason. Like I mentioned in the article HCP provided nearly $200 per year in dividends and was the 10th largest contributor of dividends for my portfolio so it stings a bit to lose that. But I'm not comfortable with owning the spinoff company so it made the most sense to me to just sell now. I sold HCP in August for just under $39 per share. Same reasoning as you, JC -- I didn't want to own shares of the spin-off. The other reason is I wanted some stronger foundation for selling options. All the best and I'm curious to see what you do. In typical fashion the share price of HCP popped up over $40 within a week of my sale which would have given me a little capital appreciation. QCP looks like it's going to be a mess so it makes the most sense to me to get out beforehand. Especially since the share price popped over the last few months to push it back to near my cost basis. I'm not entirely sure what I'll do yet with my cash but I'm looking forward to putting it to work. I just need to take a measured and slow approach rather than just throwing it around. Although I do have another option trade to report on and the details should be coming out next week. I still own HCP and plan to keep it along with the up coming spin off. Same as with VTR and CCP. I can understand why you wanted to sell and least you walked away ahead on this position. I still like the large health REITs long term and will continue to hold. Thanks for sharing. I'd love to get back into HCP after the spinoff but for me it wasn't worth holding given my concerns about QCP and what HCP will do. I figured it was best to just reassess once they're separated.